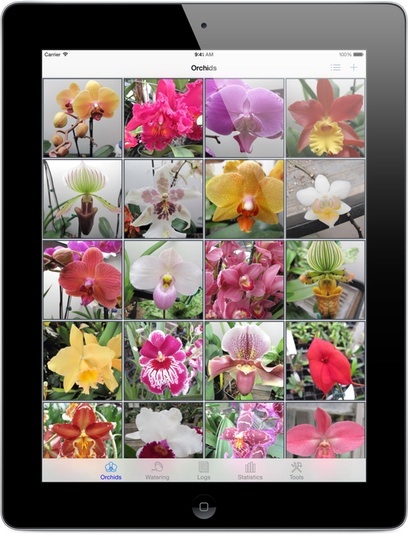 Track your orchid collection on your iPhone, iPad, or iPod touch! Orchid Album makes keeping track of your orchids easy. Track development of your plants throughout their lives, on your iPhone, iPad, or iPod touch! Want to track orchids on your PC? Orchid Album for PC is now available! Looking for the Mac version? Orchid Album for Mac is now available! Track watering schedules for multiple plants, with local notifications. Add and rearrange multiple photos per plant and log entry. Scroll through photos in a full-screen gallery view, or in thumbnail form. View your collection in table form, or by image. Protect your data with a passcode lock. Database backup, restore, import and export over WiFi to your computer’s web browser. Transfer the complete database between devices (iPad / iPhone / iPod) over WiFi via Orchid Album ODBI-format support. CSV format support to import / export your Orchid Album database to and from desktop spreadsheet applications. Orchid Report export feature. View your collection on your computer’s web browser. Great for keeping track of your collection for inventory or insurance purposes. iPad support at no extra charge! Fixes a bug with missing photo albums imported via iTunes. Fixes a bug with adding photos from iCloud Photo Library. More photo libraries are now visible. Note: This update requires iOS 6 or higher! Added support for the Mac version of Orchid Album. Added support for the PC version of Orchid Album. Note: This update requires iOS 5.1.1 or higher! Send me an email at if you have any questions, to request features, or report any issues. Check the Orchid Album Frequently Asked Questions page for quick answers to commonly asked questions. Not sure if Orchid Album is for you? Try the free Lite version available on the App Store now. The Lite version allows you to store up to 3 orchids, 3 watering schedules, and 3 log entries with 3 photos each. The Lite version includes database backup and export, allowing easy upgrade to the full version. The full version has no such limitations.